- A small sign on the wall saying: "Home Sweet Home"
- I would also like to include their 3 cats - I don't have photos of them and only roughly know their colours and breed. Photos attached are taken from the internet just for samples. 1. Porcini - brown Abyssinian - would ideally like him to be either eyeing or reaching up for the duck leg which Iggy is waving in the air - 5 sample photos attached. 2. Brownie - striped brown Tabby - doing some odd or funny pose on the bed - 5 sample photos attached. 3. Truffles - a black & white - either doing some odd or funny pose or curled up in a ball sleeping or peering out of the bed cover etc - 5 sample photos attached. I am so sorry to be so detailed about everything but I hear you're the best so would certainly be able to capture all the nuances." A simple theme, not those wild and exciting one. This could be the challenge for this job too. I try to put in simple and clean colour. Without much bright colours, it will have to rely on the lineworks and strokes to do the job - looks good and not dull. I have to pay special attention to that when drawing her face. 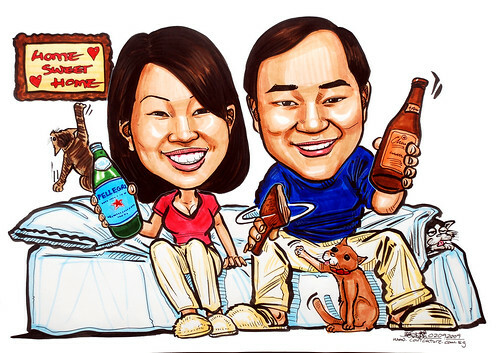 It was nice meeting you and thanks again for the fabulous caricature of our friends! "